The Bread of Life was Christ coming to earth in a body named Jesus to feed us the Truth from Heaven. Souls were starving for it, as they had allowed themselves to fall under control of the Pharisees, scribes and rabbis, who lured them away from Father, again, into illusion. And just like He fed the People Israel with manna coming out of Egypt with Moses, Father chose to send spiritual-manna to His lost flock through the Truth Christ would bring. It would be fitting that Jesus’ body was born in Bethlehem, which means “House of Bread”; but Father’s planning is awesome like that. History always repeats itself though, and today’s politicians, lawyers and all kinds of ministers still want everything they’ve always wanted… control of the people to fleece them. They hand out empty plates of promises and loads of crap. They have a lot cooking on both the front and back burners. But they don’t plan to share any of it with us, because as they stir their black-iron cauldrons, they sing “mine-mine-mine”. And it’s too bad we prefer, or are addicted to, their sweet poison rather than simple bread, like “love one another”, which is part of the New Song that everyone should be singing. Digesting Truth has never been easy, then and now. But it is POSSIBLE. All things are possible with God, and through Christ. It takes FAITH, which means TRUST in Father. Think of the faith that Noah had to build an ark despite the ridicule of others wallowing in their human lives. Think of the faith that Moses had to lead the People Israel out of captivity. Faith precedes Form. Think of the absolute faith Jesus had in Father to drink from the Holy Grail- Immortality. And if you find faith lacking, read the Bible privately with Father. Immerse in His Word, His recipe for Life. That’s what is it there for, to teach us what we should know and believe. Read it to learn the New Song, instead of latching on to these half-baked ideas of line servers calling themselves master chefs in hell’s kitchen. Satan has had thousands of years to cook up new schemes, new lies, and a new world order, except it’s the same-same, different century. Why should he change a recipe that works? He knows what selfish, entitled-to-everything people crave… the same stuffing. He works like his character in the movie “The Devil’s Advocate” did, where vanity gets them every time, as he uses their egos to puff them up like pastries. They still bare the same fruits of greed and arrogance; and they always love to believe grandiose ideas about themselves. They just can’t get the nasty taste out of their mouths. And we can’t stop eating their hot red mess, just like some people can’t stop eating habanera peppers raw, despite the tears and torture. And over time, on a slow simmer, like boiling the frog, we believe our human lives are all we have; where we become compliant and complacent with whatever Satan and his synagogue dish out, and, like the frog, they’re slowly killing us. Some of us go so far as to believe Jesus didn’t exist or Christ is a myth, because again Satan’s had thousands of years to write a bunch of mind-bogglingly mystic alternatives. Satan most certainly still knows who Christ and Father are, even knows the Bible better than most. He’s worked hard to make sure we do the opposite of what we were instructed to do by Father, who gave us simple rules to just prove we could be obedient. We are far from obedient; we still are essentially rebellious angels, full of ourselves; and we think we know what is best, because Satan tells us how intelligent we are, when we are absolute fools for doing what we do to each other and the planet. If we spent time alone with Father, reading the Bible and communicating with Him, we might learn the words to the New Song, the combination of the Song of Moses and the Song of the Lamb. For some, it might be a dusty Book on the shelf, maybe that’s been there since the ‘80s, when the entertainment industry really became our god. Instead of paying alms to false idols, worshipping them so that they can live like gods, spend time with Father, and learn to become truly Christ-like, in words, thoughts and deeds. “Wherefore, my dearly beloved, flee from idolatry… The bread which we break, is it not the communion of the body of Christ? For we [being] many are one bread, [and] one body: for we are all sharers of that one bread” (1 Corinth 10:14-17). We can’t eat from the table Christ’s prepared for us and from the buffet of the little devils at the same time, just as we can’t attend two dinner invitations at the same time. Just making an appearance at one is dishonest, because we chose the food of the other. 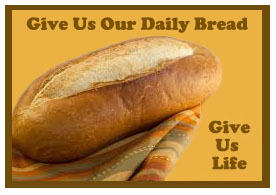 Eat the Bread from Heaven, learn Christ’s Ways, and digest His Truth. This gives a whole new meaning to “we are what we eat”. Become one with Him, in alignment with His values and beliefs. We’ve eaten way too much of Satan’s bread, the “bread of distraction”. Its recipe is outlined in Satan’s Protocol #13. While one bread means life and immortality, the other is poisoned with lies and abominations and means death. “… My Father giveth you the true bread from heaven. For the bread of God is he which cometh down from heaven, and giveth Life unto the world” (John 6:32-33). “For I came down from heaven, not to do mine own will, but the Will of Him that sent me. And this is the Father’s Will which hath sent me, that of all which He hath given me I should lose nothing, but should raise it up again at the Last Day. And this is the Will of Him that sent me, that every one which seeth the Son, and believeth him, may have Everlasting Life: and I will raise him up (into the “Cloud”, New Jerusalem) at the Last Day” (John 6:38-40). We’ll want to be on His ship, because what happens to the Earth is going to resemble a wood-fired oven. “And Jesus said unto them, I am the bread of life: he that cometh to me shall never hunger; and he that believeth me shall never thirst” (John 6:35). Yes, it takes faith to know we are more than humans; but somehow inside, don’t we know it? This is because we still are an image of Father and have a connection to Him through In-tuition, a sixth sense that we are more than what we can see, hear, say, touch and smell. Our spirits long to be with Father again, Home, Heaven. And every time we eat or drink, we should remember Christ’s self-sacrifice and follow His example daily. With this remembrance, we acknowledge His presence and His sacrifice to endure the human condition for and with us. We should remind ourselves that food is fuel. Let it remind us that once we didn’t hunger or thirst when we were angels, before the fall for the original sin of rebelling in Heaven with Lucifer. Remember, Satan turns every aspect of our lives into a human experience that we use to escape the Truth. We are in Hell. Some even escape by making food into a gourmet religion. But we shouldn’t turn it into a religion, replacing Truth with taste; and indulge, gluttonize, and feed the body more than it needs, strengthening it over our spirits. Our spirits need the Bread of Life; we need Christ, “… Except ye eat the flesh of the Son of Man, and drink his blood, ye have no Life in you” (John 6:53)… As the Living Father hath sent me, and I Live by the Father: so he that eateth me, even he shall Live by me” (John 6:57). Let us break open the Bible and partake in the Word.